I’m sure you’ve heard this combination of words before, perhaps even studied CO2 in your school science class. Maybe you've seen them on an advert on the train, or even on the TV, and we’re all now pretty used being told that ‘we’re using too much CO2’, but what exactly is carbon dioxide, and why is its effect on our environment so dire? Carbon dioxide is a gas that occurs naturally in the atmosphere, it's produced by both humans and animals and released into the atmosphere every time we exhale, and it's also produced by combustion. All this carbon dioxide is then re-absorbed and removed from the atmosphere by trees and plants through photosynthesis. What effect does this have on our planet? The amount of carbon dioxide in our atmosphere has been gradually increasing over the past 150 years, and with the increase of carbon dioxide has come the increase in the average temperature of our planet. As these levels have increased, more heat from the sun has been trapped, which has prevented the heat from escaping into space. Meaning, the more carbon dioxide in the atmosphere, the hotter our earth becomes. Coming from a very hot country myself (Australia), which emits a lot of carbon dioxide and significantly lacks an Ozone layer, I’ve felt first hand the effects of climate change. It also feels like every year in the UK we have the ‘hottest April’ or the ‘hottest May’. In fact, this year we had the hottest April day since 1949. Even with records like this, I’ve only ever thought of the effects of climate change as being on land, and until recently, I didn’t even think that the effects of climate change also impacted our oceans. Silly, I know. Why are the oceans important when it comes to climate change? Not only does the ocean cover 71% of the earth's surface it supports a staggering 85% of the world's plant life. The ocean therefore plays a key roll in helping to limit the effects of climate change. Ocean waters currently absorb vast amounts of carbon dioxide, and they work like a buffer to help reduce the effects of climate change. How does this affect our oceans? As the ocean absorbs carbon dioxide and becomes warmer, life in the ocean struggles. Unfortunately, each year our coral reefs around the world suffer bleaching events. Like a clown fish and an anemone, coral and the photosynthesizing algae called zooxanthellae, live together in harmony. Basically, you can’t have one unless you have the other. Interesting, huh? 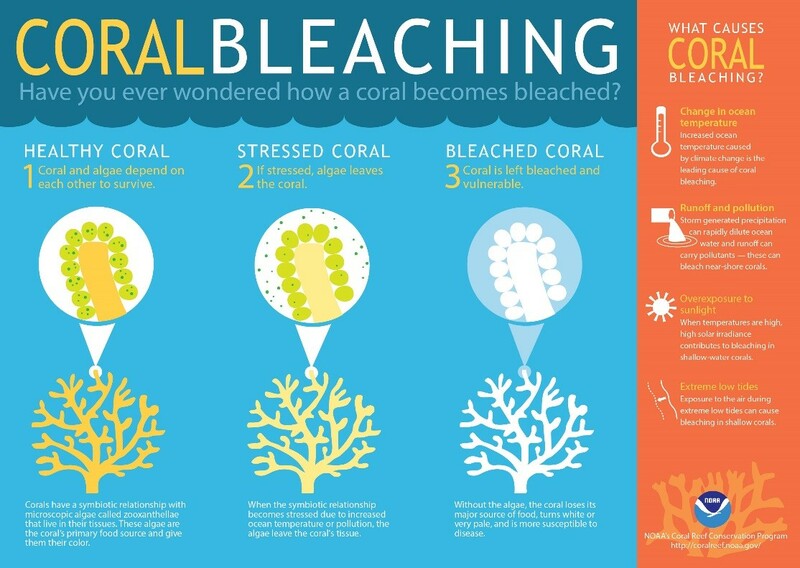 A chart on coral bleaching, photo courtesy of NOAA’s National Ocean Service. Coral reefs are the foundations of reef ecosystems, but unfortunately with the increase of carbon dioxide in our atmosphere, and the warming of our oceans, coral reefs are facing up against mass bleaching events. 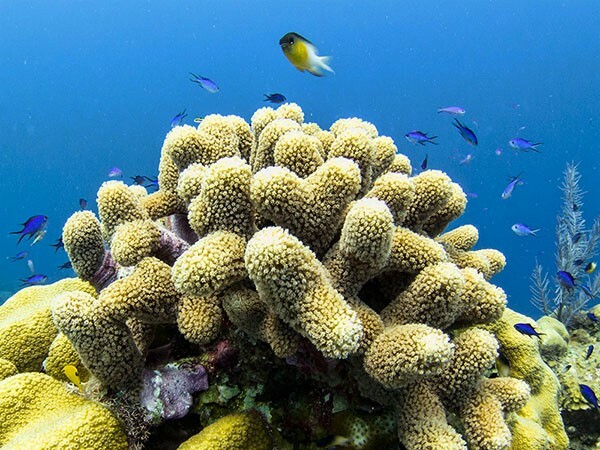 The zooxanthellae algae that live in harmony with the coral, don’t like water that is too hot, so when the water becomes warmer the algae stops producing carbohydrates, which feeds the coral and instead it produces toxic waste. The coral polyps then reject the zooxanthellae and expels it. Once the coral has expelled the zooxanthellae, it turns white, known as bleaching. 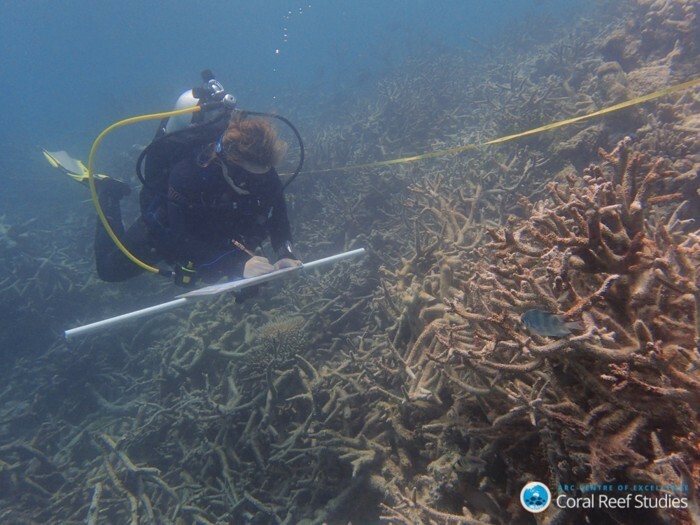 A researcher on the great barrier reef – photo credit: The Atlantic. Walk, cycle or take public transport, or if you have to drive, car-pool. Make climate-conscious political decisions. Government policy has a huge impact on how companies operate and energy is produced. Eat less red meat. Livestock animals produce large amounts of methane, so fewer steaks will mean less CO2. Make your home and household energy efficient. If you don't need as much energy to heat your home, less will need to be generated. Buy energy efficient appliances. Less energy required to do your washing will cut your carbon footprint. and, switch to renewable energy! Article: 1000 Five-star Trustpilot Reviews!